After years of aging in the elements, your home's exterior surfaces and trim begin to fade, your painted doors start to look worn, maybe even peeling, eaves and soffits and window frames look tired. These symptoms tell you it's about the time for some refurbishing and updating of your property with a new fresh paint covering on your exterior surfaces. Time to call Pro Painters Colorado Springs. 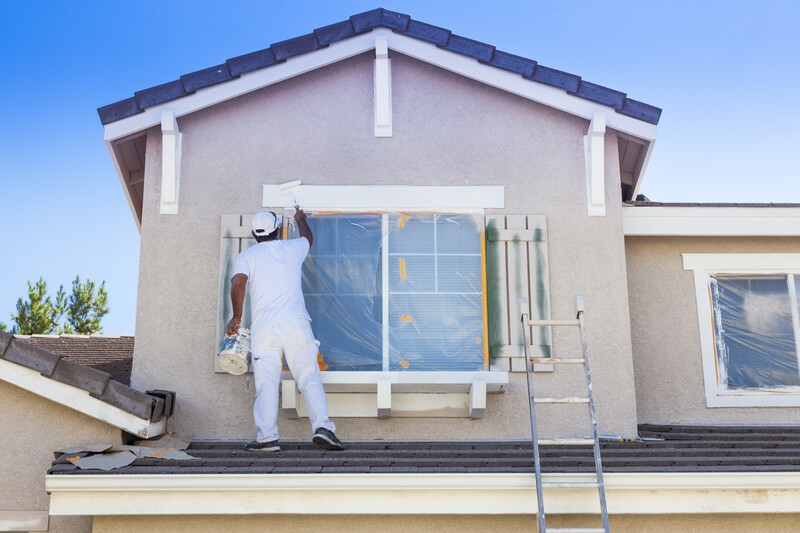 Time to call the best exterior painting contractors for the job. ​Pro Painters Colorado Springs is your high quality finish painting company. We are tops in preparation, proper cleaning, priming, sealing, drip coverage and safety procedures. After final coat painting we finish with a thorough clean-up and walk through inspection to affirm your satisfaction. We use the highest quality materials and mixtures to ensure that your exterior has a beautiful new finish that protects from the elements and lasts! Whether you want a new theme for your house, or just simple touch-ups, our company can provide long-lasting, quality painting service at an affordable price. The best quality paints should still look vibrant after eight to ten years. Of course weather has something to say about that. We review the paint guarantees and expectations with you during our visit. ​PPCS will first clean the area to be painted. We power wash and scrub grimy areas with eco-friendly solutions. This procedure also removes peeling and chalking paint, mildew and other unwelcome materials that have attached to the target surface. Scraping comes next as all loose and peeling paint must be removed. This is the beginnings of the best surface prep for adhesion, allowing primer or paint to grab hold of the surface for lasting results. The cleaner the surface is, the better the paint adhesion will be. While we are there, you might consider other areas that need power washing such as the driveway, walkways and patios or decks. When we think painting exterior doors or exterior windows, quite often they are aluminum or metal of some sort. Note that there are slightly different abrasive prep techniques go into these surfaces. Decks, fences and other wood structures are usually built of soft wood such as cedar, pine or pressure treated lumber and have a lifespan directly related to the care and maintenance put into them. With the constant bashing from winds, rain and driving snow, anything Colorado can throw at them, and they will eventually lose their protection and begin to show wear and even rotting. Outdoor revitalization and enjoyment is not complete without the deck and fences looking ship-shape. Eventually, the deck gets tired; fence repairs or staining might be needed. You might not notice these things because you are living with it every day. But no doubt, care needs to be taken if you want your assets to have an extended life. We have long time experience in working with wood and concrete products and structures such as decks, gazebos, sheds, fences, hard surface Patios and Concrete Flooring. So if your fence is leaning one way or another, give us a call. A diligent maintenance program will extend the life of your wood assets and keep your property looking beautiful and something to be proud of. We all know the importance of curb appeal to a home. The first coat of ​paint and finish coat (tricky way of saying second coat) will bring heaps of joy, an awakening, enlightenment - or maybe not. However, it will most certainly provide you with the color and finish you were hoping for, a reflection of you. A home that has been properly prepped and painted will be protected from the damaging sun’s rays for years to come and you can’t deny the good feelings that come from living in a smart looking home, not to mention the added curb appeal. ​One of the fun parts of exterior painting is that we get to work outdoors, always enjoyable. Ya still gotta pay us though. There's no need to look further for your asphalt, pavement and concrete cleaning, painting and coatings needs. Garage floors can get downright dirty and greasy. Our cleaning services are second to none; we'll steam wash, pressure wash or scrub as required. Addition we can recoat your pool deck, garage and walkway areas with a patented rubber coating that looks and feels fantastic. We also love to work with concrete paint and sealers as well; Pro Painters will ensure that the best job will be done to make your hard surface gleam. In addition, we clean terrazzo, marble and granite any most other hard surface with the same care and pride of workmanship.​ Every surface has its own special requirements, we know that; we'll never compromise. Want to paint brick, or re-cover concrete? Call us!